My work locating the marginalia in the volumes of the John Stuart Mill Library here at Somerville started at the end of June. Just over 10 weeks and about 320 volumes later, and my spreadsheet runs to over 12,000 entries – that’s over 12,000 asterisks, sidelines, underlines, symbols, full sentences, critical comments, incredulous question marks and indignant exclamation points. As Albert has explained, the sheer number and variety of marks show the different ways in which James and John Stuart Mill used these volumes: as textbooks to be mined for material for parliamentary speeches (or later, for Oxford undergraduates’ essays); as teaching materials to be memorised; or as works by contemporaries to be rigorously critiqued. Rather ironically, given that my job is to find written marks, one of the things that has repeatedly struck me over the course of this project is that marginal annotations are just one of a variety of traces left in these volumes by readers. Evidence of reading comes in many forms: alongside deliberate, handwritten marks are the accidental, unintentional, physical ones too. 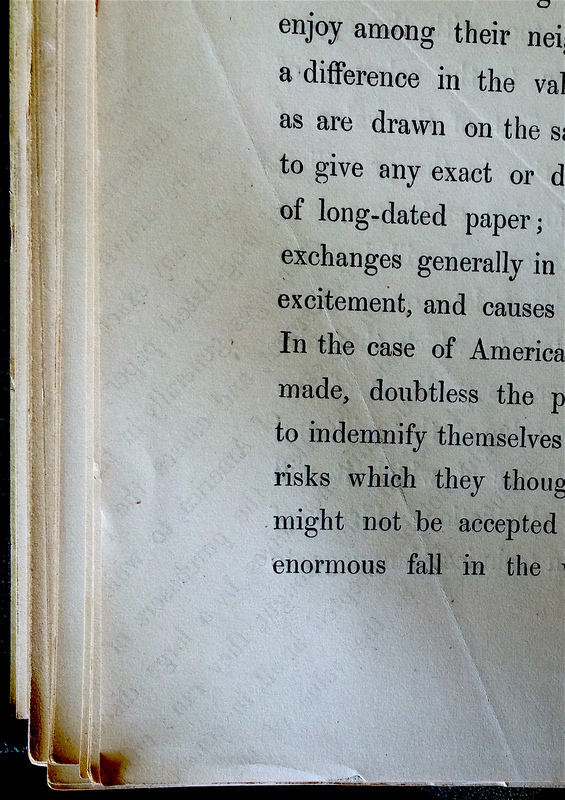 For example, countless ink blots and idle pencil marks pepper the pages of many of these volumes. We can’t tell who they were made by, and can only make a rough guess as to when, but their very presence – in margins, through lines of text and across otherwise pristine, blank flyleaves – is proof of reading. They tell us that someone saw the page, paused at it or flicked past it, holding a pen or pencil a fraction too close to the paper. Then there are the ways readers have used the physical features of the books themselves. I’ve found pages marked in many different ways, from corners neatly – and not so neatly – folded over, to ribbon markers placed – or simply left? – between specific pages. In the absence of ribbon, other items have been used as improvised bookmarks. My favourites include a handwritten note on how to run a local society election (appropriately tucked into The Ballot Act, by W. A. Holdsworth (1880)); several early twentieth-century library loan slips; and a note in what looks like a shaky, nineteenth-century hand, complaining about a leaky water closet. 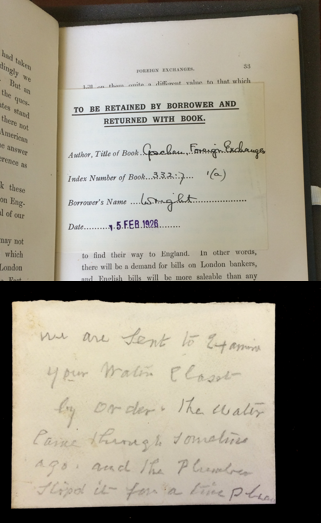 This loan slip and note about a leaking water closet are just two examples of the array of items used as bookmarks. The physical state of the books gives some clues too. Now-flimsy binding and evidence of rebinding could be as much an indicator of use, as of age. More unusual is the faint, reverse imprint of handwriting and printed text from other sources, that is evident on the pages of several volumes. Faint imprints like these, left on the page by other printed texts and handwritten notes, repeatedly occur in the volumes in Mill’s library. What might we deduce from this about Mill’s reading habits? It suggests open books being stacked chaotically, or essays and notes tucked between the relevant pages of a well-used text. It suggests cross-referencing and active, interactive use. These volumes were opened, even if they weren’t annotated. Even more intriguingly, some of the physical properties of these books also point to a lack of use. A surprising proportion of the volumes in the library have unopened, or uncut pages. It is the product of the way they were made: multiple pages of text were printed onto one large sheet of paper, which was folded up, bound together with others, and then the folds cut, in order to separate individual pages. In several of these volumes, however, the pages are still attached on their outer and top sides which means that they can’t be opened, and the text within them can’t be read. 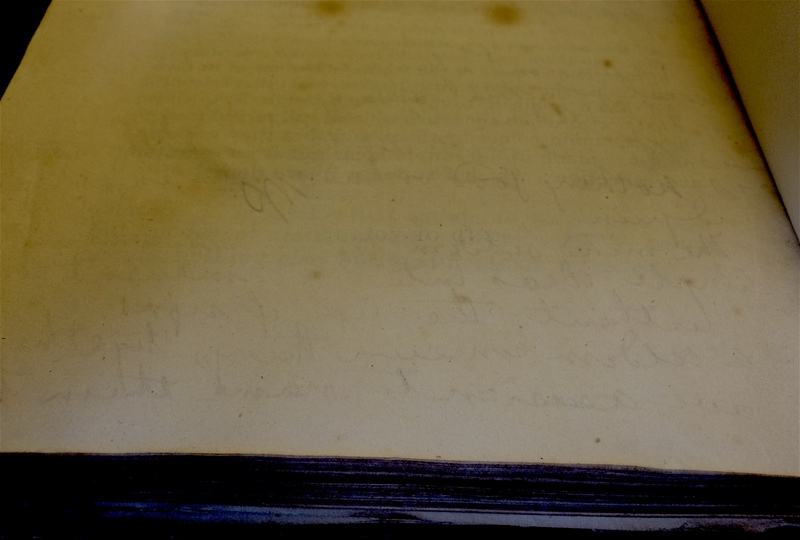 Instances of unopened pages that appear in the books in this collection most often resemble the example depicted here, where the pages remain uncut along their top side. 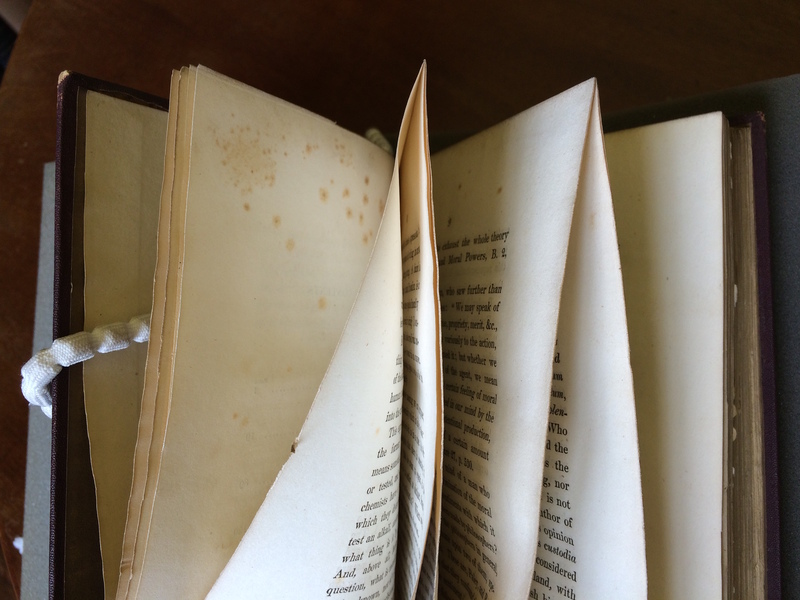 The presence of uncut pages is a pretty convincing indication of which volumes – and how much of them – Mill didn’t read, and in some cases we can hazard a guess as to why. The large quantity of uncut pages in a multi-volume edition of Jeremy Bentham’s works, for example, is unsurprising given that it was reputedly very poorly edited and full of inaccuracies. In addition, there is a strong correlation between the amount of flattery or admiration for John Stuart Mill that appeared in a book’s title page, preface or introduction, and the number of its pages that Mill himself left uncut. It is as if he was unimpressed – or at least left unmoved – by the admiration of contemporary writers. These non-written, more physical, accidental indicators of reading – and non-reading – do not strictly fall within the remit of this project. However, the great advantage of a digitisation project like this one, which incorporates photos of the physical appearance of these books down to the very page, is that these aspects will be captured and available for the future researcher to examine. A roughly-cut page, a folded corner, an ink splatter across lines of text; all give a richer sense of the ways in which these volumes were used, and provide vital context to the 12,000 marks we have found so far.